So you are looking for some batting tips? All right, here comes one. To be a good hitter, you have to go up to the plate feeling confident and with a clear mind. Or to say it better, you have to go to the plate knowing you will get a hit, and you are not thinking about anything but getting that hit. Yes, you need to be a determined hitter. Tips for batting should always start from the top down. By that I mean you have to understand that believing you will hit the ball is just as important as your batting stance, your hand position and even your swing load. Not every baseball player gets to pitch and have that trill of getting batters out. Not every baseball player will make that great play in the field. But every baseball player who has played the game gets to experience what it’s like getting a hit. After that first hit you stand on the base and high five the coach. He’s trying to tell you how many outs there, and you are trying to find mom and see her big smile. The next kid strikes out and the inning is over. That’s ok, you are floating back to the dugout. A couple of teammates tell you nice hit, and you hear your dad say “Way to swing the bat son”. Yeah, it feels real good. To get that great feeling more and more, you need to boost your confidence. And how are you going to do that? Listen real close. Practice, practice and more practice. The more you do something, the better you get at it. Older players already know this. 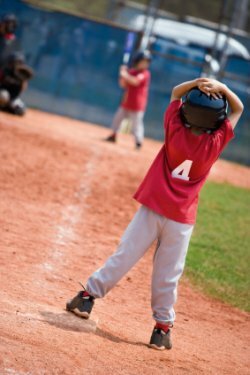 But for my number one and two youth baseball batting tips, it is take some swings, and then take some more swings. If you have a batting stance and swing that you are comfortable and happy with, then read on. If you think your batting stance, pre-swing load and your swing needs some fine tuning, then go read the batting drills on baseball mechanics and batting techniques, and then return back here. If you are going to practice as much as I suggest and as much as it takes to be a good hitter, then you want to be practicing with a correct swing. Make sure your balance is good (you are keeping your weight forward), you have the proper foot work (front foot strides slightly forward), and that your head stays on the ball (you watch the ball all the way in). OK, you are back, and now you have the prettiest swing around. Let’s move on. Some hot hitting tips are just around the corner. Here would be the ideal situation. Take 30 swings just into the air. Remember, it only helps if you are swinging the same “correct swing” every time. So don’t rush thru it, take your time on every swing and get it down perfect. That’s what we are looking for, the perfect swing. So at this stage you are working hard on your swing mechanics. Which means you are working on your batting stance, balance and load. Next, move to the batting tee. Take 40 swings off the tee. Again, make sure it is 40 good swings. If possible, have someone watch you. Tell them to stop you if they see your swing changing. You can also tell how your swing is doing by watching where the ball goes. You want it flying straight ahead. Here you are working hard on using your legs and turning your hips with the swing. The more you use you legs, the harder you will hit the ball. The last stage is 40 swings of soft toss. At this stage you are working on getting the hand eye coordination down path. And again, you want to hit a line drive with the ball. Swing under it and you will pop it up. Hit the ball on top and you will drive it into the ground. A good square hit right in the middle of the ball is perfect. If there is no one around to do soft toss with you, then just take 50 air swings and 50 batting tee swings. And if you do not have a net to hit the ball into, take a 100 air swings. The key point to these batting tips is take 100 swings a day. After taking 100 swings a day for a couple of weeks, swinging the bat will be just like walking. You won’t even be thinking about it. Your swings will be natural and all you have to do is think about where the pitch is at. Now you have the confidence to go to the plate knowing that the pitcher is in trouble. He might not know it, but he is facing a good hitter.